Contemplating on our route through west China we noticed that we had a chance to experience the life of the Amdo Tibetans. So we quickly decided on going west from Xian instead of south to Chengdu. 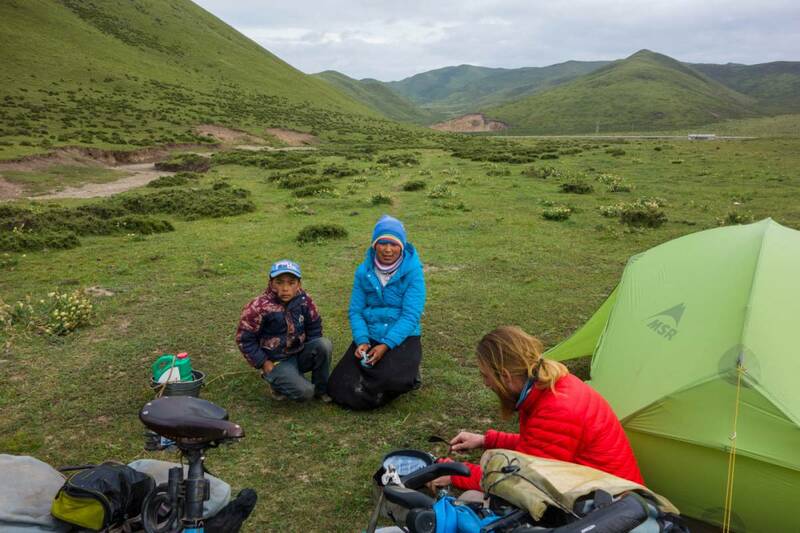 We were cycling from Xian to Labrang en-route to the Amdo Tibetans. This trip has been very interesting so we have many photos in the next galeries: Xian to Tianshui, Tianshui to Lixian, Lixian to Minxian, Minxian to grasslands, Grasslands to Hezuo, Hezuo to Xiahe/Labrang. The days in Xian were extremely warm, or hot one might say, the average temperature during the day was 40 degrees. This meant exploring the city was not so much fun and we did the most exploring at sunset. Xian is famous for the more than 2000 year old army of Terracotta warriors of emperor Qin Shi Huang which are impressive. We went there from Xian with a bus from the north gate of the city here we found the tourist busses which will take you directly to the Terracotta warriors. As always in China theres a twist and the busses will stop multiple times to pick up locals with there goods and drop them off at the next market, this makes it a bit of a long ride but we got to see a bit more of the outskirts of Xian. At the Terracotta Warriors there are hundreds of Chinese and western tourists so sometimes a bit stressful walking around in the crowds. We did enjoy the experience and the army of the Terracotta Warriors is indeed a one of a kind. 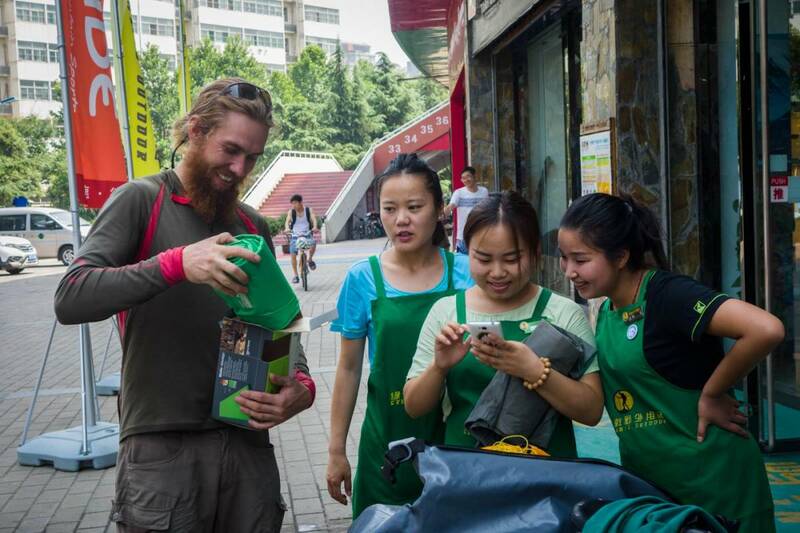 Time to leave the city with a twist as Martins mattress had developed a defect we first had to cycle past an outdoor gear shop, Greenants Outdoors in Xian. A very well equipped shop and the people had the mattress ready for us and we did the exchange without the cost, great service from Thermarest and the Greenants shop. We cycled out of Xian quite okay with the normal traffic issues when leaving a city. We had a quick lunch at the outskirts and then we were out of the city. We cycled past the Qinling mountains which are known for wild pandas and also houses a few places where it should be possible to see them. We had heard of a park which should be on our route we just never found it, only saw signs to an other park at Foping that would be a detour of 200km so not an option. 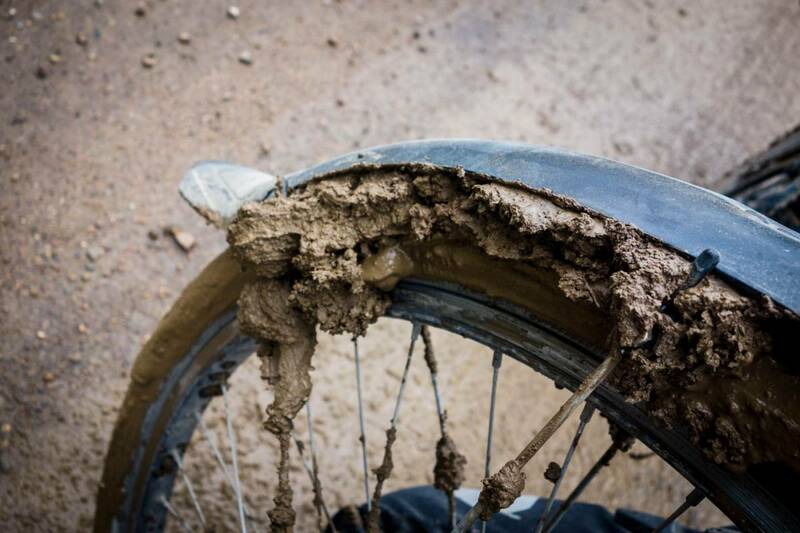 The first days of cycling were so hot and dusty we had days of 44 degrees. Also we had some raging thunderstorms and pounding rain in the night. Soon we started climbing and then temperature cooled down a bit. We cycled along the river Wei on a semi big road al the way to Tianshui. On this route we met multiple Chinese cyclists who were either cycling to Lhasa Tibet or to the Qinghai lake. We would turn of the bigger road at Tianshui already looking forward to that. 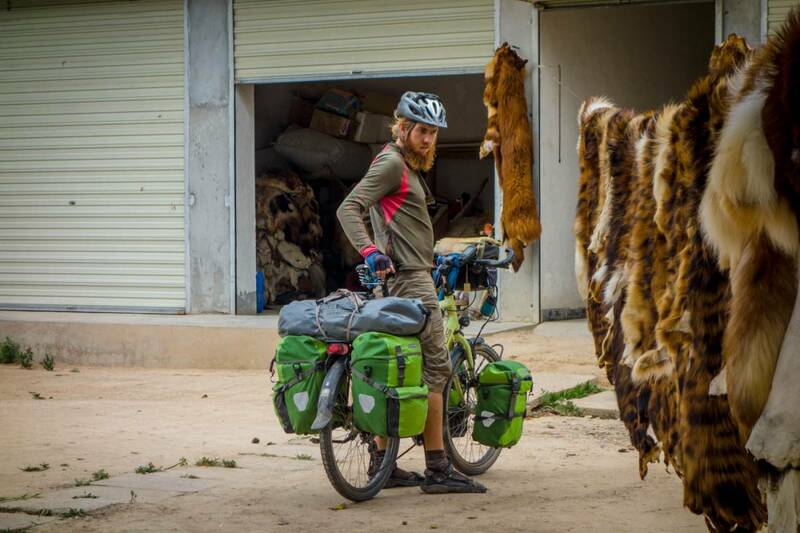 We cycled past many different villages but one section before Lixian was quite a section as for 5 kilometres or more through several Muslim villages they were selling animal skins and preparing them for sale. We stopped and tried to figure out where the animals came from and what kinds of animals. We are not here to judge the people and as we do not know of the origin of the animals it is hard to say if it is wrong or right. Anyway we do not support the selling of endangered animals skins. It was an experience to see this happening at the side of the road. 15km before Lixian we were joined by two young guys on bicycle and they showed us a new road which was not yet open to traffic so a nice ride to Lixian and they also helped us finding a hotel where we were allowed to stay and for an okay price. Soon after having settled in the room Martin could feel his throat getting worse than the last few days where he had felt a bit off. Yes and the fever was there that turned out to be 2 days in bed for Martin to get the fever down and get better. When Martin was better Susanne started to feel a bit down so we stayed another day to see how we would feel. 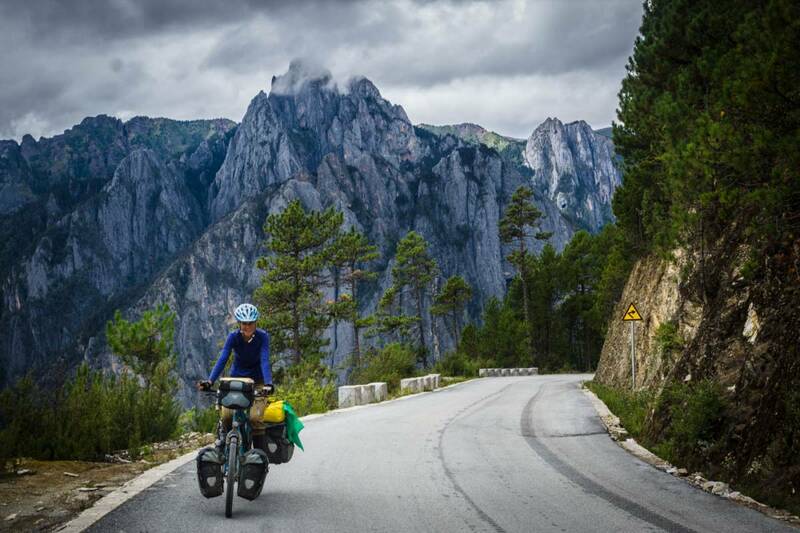 We left Lixian and knowing the first 3000m+ where soon coming along we were excited and nervous as it had been a while that we had cycled at this high altitude. After 2 days of cycling Susannne felt worse and we had some tough days with mountains and Susanne with a fever. One of the days we were invited in to stay with a family by Jackie Chan, a great young guy who spoke some English. We where fed and shown to a house in the village where we could stay. This really helped us out as it was a rough day. The road we were following was being upgraded along a loooong section. This meant road works and mud but also less traffic so some bad with some good and great road. Especially the start of the road the tarmac was still quite good and there was no traffic at all. We were very lucky. We cycled through valleys and over passes and the last stretch was very very muddy also because it had been raining on and off. We had some cute kids running up on the hill to catch us and wave which was a nice surprise. We made it to Minxian at 2400m a city with a nice feel to it. Susanne needed a rest day and to see if the fever would go down. While Susanne was resting Martin went out and enjoyed the multicultural city with a big Muslim quarter and a Buddhist temple at the top of a hill in the city. For dinner in Minxian we went for the easy choice of the Dicos (A Chinese KFC) the last night in town the floor manager of the restaurant invited us for the local “snake” well she meant to say snack and we agreed to join. We went out to a small back alley restaurant and had a great egg and raisin soup and small shaslicks. Really a nice evening with Le Fan after which we said our goodbyes. We left Minxian not knowing that the language and people would soon change. Before we knew it we entered Shambala region and signs and people would no longer speak Chinese but Tibetan Amdo dialect. We were quite excited of this change of scenery and people. The houses are different, many have a mud brick courtyard and their house inside on an elevated plateau. Often the house has windows to make a sunroom in front of the house in the courtyard. The change of villages also meant that there were less shops than the Chinese version. Which means we need to be a bit more self-sufficient. We would cycle through villages where the women would be dressed in the traditional dress and have their beautiful long black hair braided, a beautiful sight. The people would look as surprised at us as we at them but always with a smile. Now we were in the Amdo region of Gansu province where a part of the population is Tibetan. When knowing the Chinese it is clear to see new Han villages being built and when reading about the Han Chinese in these regions we have learned that the government do offer very good loans and opportunities for the Han Chinese to move here. It seems that the people are able to live with each other. We really enjoy the way that multicultural and different religions are able to function here. We often eat at a Muslim restaurant as they make some great noodle dishes and see Buddhist monks shopping at the Muslim markets. We do know that this is the surface and history has not been forgotten and is still complicated but life does continue. There were a few hills to climb but knowing the Chinese the roads were mainly good and not steep. We entered some grasslands where yak and sheep were grazing. We saw villages with very fancy looking outhouses and could only think of an NGO who decided these villages needed drop toilets. Good idea but it didn’t look that they were in use. Same counts for basketball courts in most villages. We saw some youngsters play, but in some villages the people were growing crops, straw and grain on the basketball field. The necessity of food is higher. We camped one evening in grassland area. In the valley there were many many yaks and sheep. We had found our spot and were setting up camp when a lady walked passed us. We invited her over but she had to go. Ten minutes later she was walking in the opposite direction. A younger boy had herded three yaks together. The woman held a bucket with a jerrycan and emptied the water in the bucket and started cleaning her apron. She shook the apron in the wind and tied it on herself, emptied the bucket and head over to the yaks and started milking them. The boy made sure that the other yaks kept enough distance and at the same time he was looking what these two strangers were doing in his field. After she was finished milking she put the milk in the jerrycans and her and the boy came over and sat with us next to the tent while we were cooking. We offered food but they said they would eat at home. Slowly the sheep and yak were coming closer and it was time for the woman to head home with the sheep. The boy helped to herd them and we got company from a man, a family member of the other two. He was very curious about what we were doing. When Susanne was inflating the air mattresses he and the boy who had returned peeked into the tent to see what was happening. He was also sad that he couldn’t see the stove working because we had finished cooking by then. Slowly it became dark and we prepared for sleeping. He left running after one of the herds. All the yak were on the move now and literally hundreds of yaks passed our tent that evening, At one point we were in the tent and heard footsteps running towards us. We opened the tent and two faces shown, a woman and her daughter were curious who we were and what we were doing so they came over and after a short chat went on our way again. We got up early the next morning because we thought the animals would be early too but we had a lovely quiet morning in the valley before heading off with the bike again. By now we had cycled over 3300 meters altitude and we were on the way to Hezuo. Just before Hezuo we had seen a few Tibetan girls walking along side the street. 5km further on the road all of a sudden a monastery appeared. It felt like a special day because many Tibetans were coming and going and walking the kora of the monastery. The people were very beautiful and felt quite focused. It was a very special feeling because there were no other tourists. We had to get used to the people a little bit because their way of communicating is a little bit different than we are used to in China. Nice to learn more about the Tibetans and their culture and traditions. They sure have an eye for beauty, not only in their clothing but also in their buildings and art. After spending some time there and having some food at the small market we continued on to Hezuo where we did some shopping and visited Milarepa Palace and the adjoining temples. We had a cruising 30km downhill from Hezuo to the turnoff of the road to Xiahe, better known as the city of Labrang Monastery. 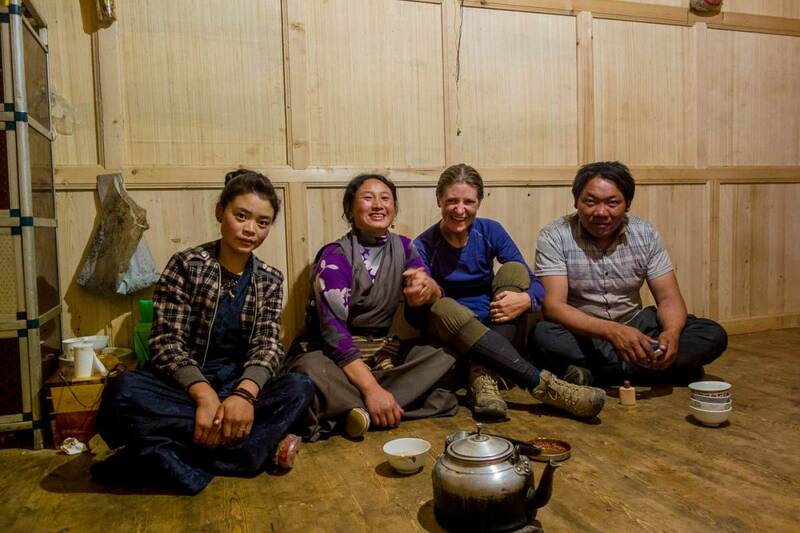 We drank a quick Milky Tea at the petrol station and continued up again along the river towards Labrang. The river was beautiful, there were temples on the way and we managed to find a great camping spot in the valley. The traffic was quite busy though, more than we had expected. Many big white cars, Chinese with money on the road honking their horns of course. We made it in to Labrang early and because Susanne’s fever was not totally down yet she went to bed while Martin started discovering the place and we found out that the next day would bring a festival. 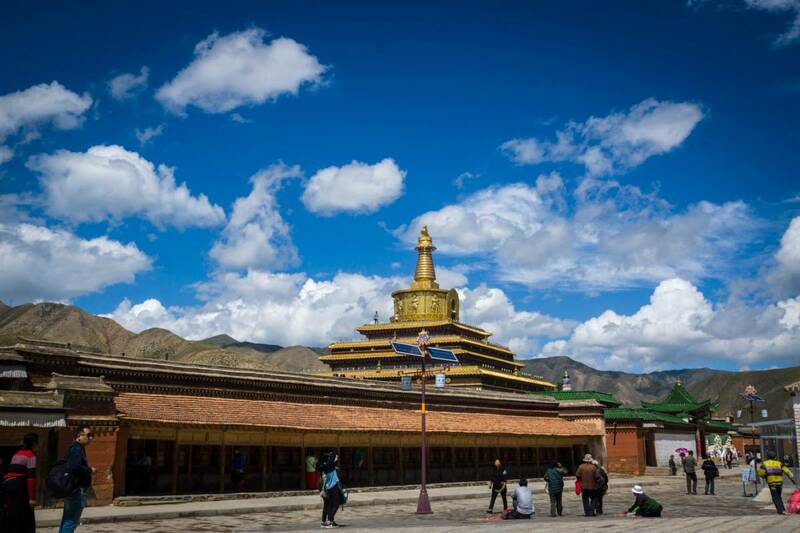 Xiahe is a quite relaxed town with a Chinese muslim side and a Tibetan side, split in half by Labrang Monastery. 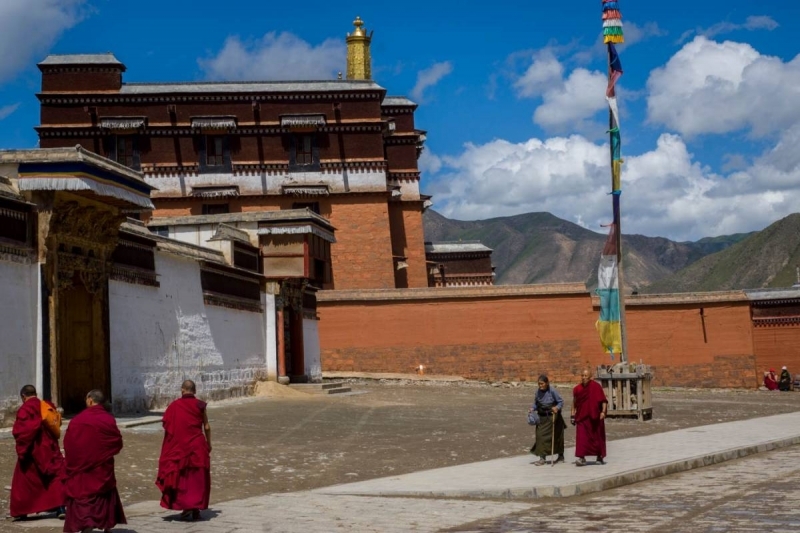 Labrang Monastery is a very special place. We have been feeling very happy of experiencing this place and the culture surrounding it. 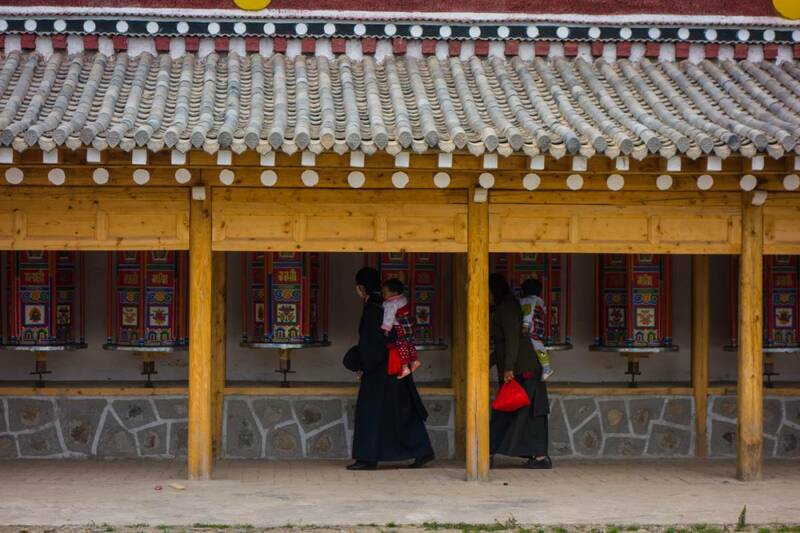 The Tibetans have no easy life and during the Cultural Revolution many cultural heritage got ruined, also at Labrang Monastery. But they have been able to build it up again and it is beautiful. We stayed at Tara Guesthouse which was okay and most other budget travellers stay there. The city is beautiful and the monastery has an amazing atmosphere. We walked the inner and outer kora, on the inner kora making sure to turn the praying wheels. It is nice to see some other foreigners and not be the only strangers in a Chinese town and sharing ideas and stories a little bit. Also the weather has been quite nice. After having had a lot of clouds on our way here two days have had beautifully blue skies (with some rain in between). The festival was amazing with many beautiful women in their best clothes with their best jewellery. 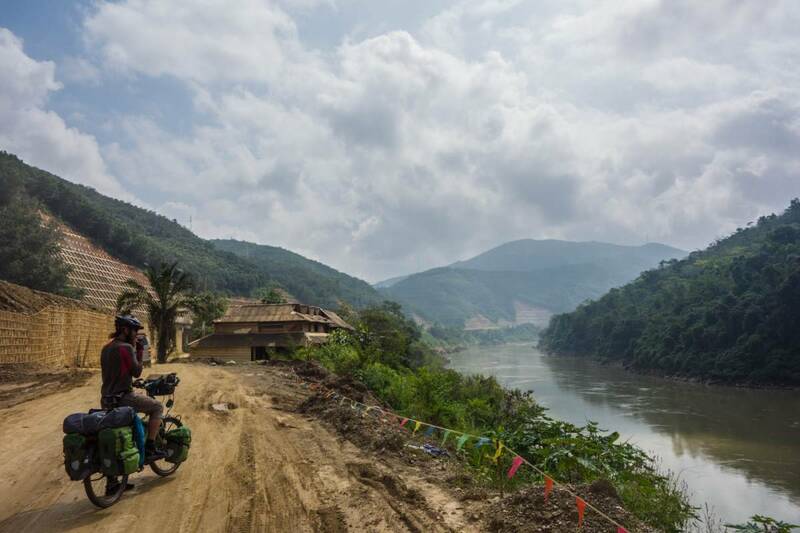 We are preparing for our next stretch where we will head South-West towards Ganzi in Sichuan province.